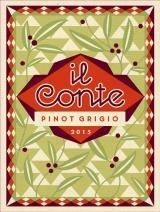 "Il Conte is a proprietary label of Pinot Grigio and Montepulciano made in conjunction with the Botter winery in the Veneto. The Pinot Grigio is 100% tank-fermented, and produced in a clean, refreshing style. The Montepulciano is a delicious, spicy, fleshy, everyday red, a perfect match for pizza, pastas and other classic Italian fare. It is aged predominantly in tank, with a small percent of barrel to add complexity. The brother-sister team of Carlo and Annalisa Botter are third generation winemakers in the Vento region of Italy. Their great grandfather, Carlo Botter, began farming in the Veneto in the first part of the twentieth century, and began exporting his wine outside of Italy in the 1960's. His three sons expanded to their vineyard holdings to include sites in Friuli, Abuzzi, and even Sicily."